I'm a big fan of Anne Booth's Refuge, a Christmas picture book that highlights the refugee aspect of the classic nativity story and I have given copies as Christmas presents to quite a few kids. Some of those kids are now old enough to tackle stories on their own, so Anne's new series will come in very handy for birthdays and other gift-giving opportunities. Magical Kingdom of Birds, aimed at 7 to 9 year olds, has a very cute premise. Maya has inherited a magical colouring in book from her late mother. When she tries to colour in one of the pictures, she falls into the book, landing in the magical kingdom of birds and fairies. Here she becomes 'the Keeper of the Book' whose coming has been foretold. Maya needs sticks to help her walk and this gives her confidence issues. The magical adventures in the enchanted kingdom help her prove to herself that she is brave and that, if she believes in herself, she can achieve great things despite her disability. 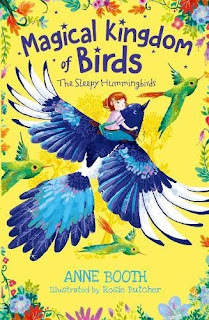 In the first book, The Sleepy Hummingbirds, Maya befriends a fairy princess called Willow whose evil Lord Astor has usurped the throne of the magical kingdom. The despot is planning to enslave all the singing birds. Can Maya and Willow, along with Patch the magpie, retrieve the princess's enchanted cloak of feathers from his castle and save the birds? into statues. 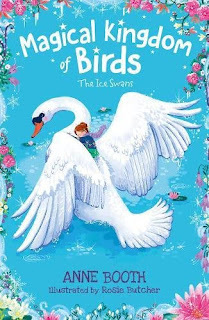 Maya, Willow and Patch must outwit him and his fairy guards once again to rescue the birds and the kingdom. These short books are very well written, with pacy chapters and lots of direct speech, which helps move the plot. Kids will love them. They're a feathery delight. The b&w illustrations by Rosie Butcher add to the richness. As a bonus, there is a fact file at the end with info about the real-life birds that inspired the stories. And there's a colouring in page too. Who knows what will happen if you colour it in? Saviour Pirotta's new picture book, The Unicorn Prince, is illustrated by Jane Ray. It was an editor's choice in The Guardian and The Bookseller. His novel Mark of the Cyclops, an Ancient Greek Adventure has recently won the North Somerset Teacher's Book Award for quality fiction. Follow him on twitter @spirotta.